Officer William Porter in 2015, Image via Getty. 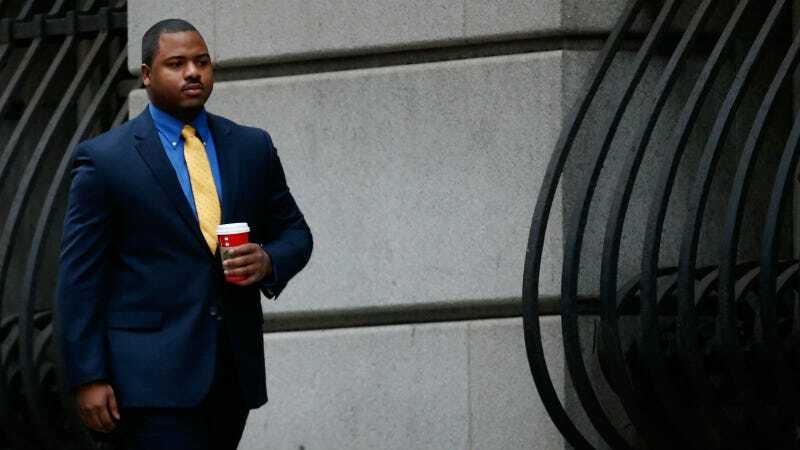 Following the acquittals of three Baltimore police officers charged in the arrest and death of Freddie Gray in April 2015, Chief Deputy State’s Attorney Michael Schatzow announced on Wednesday that his office was dropping all charges against Garrett Miller, William Porter and Sgt. Alicia White, according to The Baltimore Sun. Circuit Judge Barry G. Williams, who presided over the initial cases, would likely handle the next round and deliver similar verdicts. State’s Attorney Marilyn Mosby held a press conference on Wednesday to speak to the massive disappointment this news brings and began by explaining that she’s not hellbent against cops. “I’m anti-police brutality. I need not remind you that the only loss and the greatest loss in all of this was that of Freddie Gray’s life,” she said via CBS Baltimore. She went on to say that she’d respected Judge Williams’s gag order on herself and her staff regarding the case despite receiving death threats and harassment during the entire investigation. “I was elected the prosecutor. I signed up for this, and I can take it,” she said. Mosby added that the Baltimore Police Department had not been cooperative in building her case and had she pursued the charges against the remaining officers, she likely wouldn’t have gotten a conviction. “There was a reluctance and an obvious bias that was consistently exemplified not by the entire Baltimore Police Department, but by individuals within the police department in every state of the investigation which became blatantly apparent in the subsequent trials,” she said. Gray died last year after suffering lethal spinal cord injuries during an alleged “rough ride,” in which police officers drive recklessly with suspects handcuffed but not buckled into the back of a police van. Following his death, locals protested the violence in a movement that went from peaceful to frustrated rioting. Many felt all was lost until Mosby stepped in, spoke to the masses directly and promised to bring justice. Over one year later, the outcome is similar to cases like the deaths of Eric Garner or Mike Brown, where the evidence seems clear to many outside of the courtroom but not so much inside. In December, Officer William Porter was dismissed after garnering a hung jury and then a mistrial. In May, June and July, respectively, Officers Edward Nero, Ceasar Goodson and Lt. Brian Rice were subsequently acquitted during bench trials, which meant they never even went before a jury. Both Porter and White were scheduled to return to court for a retrial and a trial, respectively, this fall.